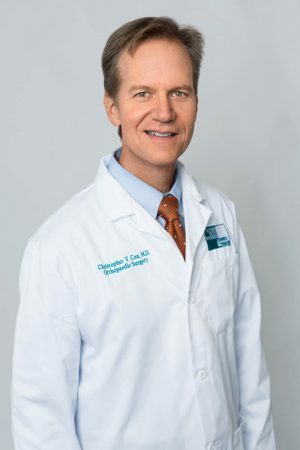 Dr. Christopher V. Cox is a board certified orthopaedic surgeon specializing in joint replacement surgeries, including hip replacement, partial and total knee replacements, as well as revisions of total joint surgeries. He is also a specialist in hip resurfacing procedures and has performed them since their introduction into the U.S. in 2006. He performs both minimal incision posterior approach as well as direct anterior approach hip surgeries. Dr. Cox is the Medical Director of the Joint Replacement Center at California Pacific Medical Center in San Francisco, CA. Additionally, he performs surgery at the Presidio Surgery Center. He is also an Associate Clinical Professor, Orthopedic Surgery, University of California, San Francisco. He is actively involved in the education of medical students, orthopaedic residents and physician assistant students.